She felt there was a need. The warning she did heed. Trouble she did not need. Who did this awful deed? That was her good deed. I love your calendars. Every one of them are bright, colorful, and oh, so helpful. I mean, how else would I know what the months and days are, if not for you. The thing is, I have a problem. You may not think it is a big problem, and for you it isn’t. You can only benefit from my dilemma. You see, I like so many of your calendars, I have a really hard time choosing one to buy. I want them all. I only need one, yet I wind up buying quite a few. It’s because the pictures of kitty cats, puppies, horses, and scenery are so pretty. Then, as I’m trying to choose, I see the trivia ones, then the joke-a-day ones, then the cartoon ones, then the ones based on all the television shows. All of these come in different styles, too. The regular, hang on the wall types, in all sizes, the ones you put on a desk, and the small planner ones you can carry around. There is a calendar depicting every subject, and taste the buyer might want. How are we supposed to choose? I stand there at the display, weighing one against another. Which one has the ‘prettiest flowers’, the ‘cutest cats’, the ‘funniest’ cartoons? It is impossible, I tell you. All this calendar buying, I’ll admit, is good for your company, and I do enjoy looking/reading them. I suppose one way we can have an enjoyable experience in buying lots of them, is to give them as gifts to friends and family. Then, what do you know…we can sit back and wait to receive more calendars…the ones they bought as a gift for us! I have this candle. It sits on the shelf in my living room, in a square, glass jar. 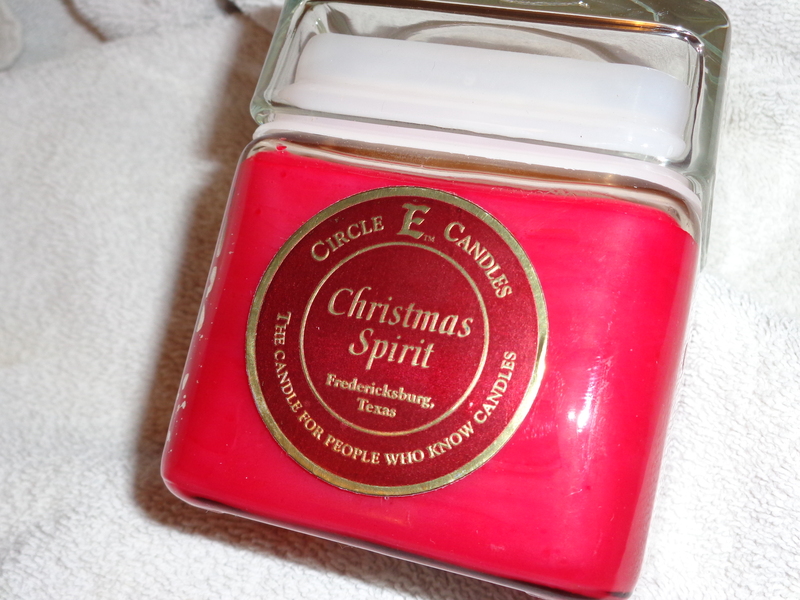 It is red, smells good, like spice, and is named “Christmas Spirit”. I’ve had it awhile, but have never lit it. My sister gave it to me because she was scared of it. You may think that’s a strange reason to gift me with the candle, but I don’t. She knows I love all weird and paranormal things, and this candle had been acting ‘weird’ over at her house. I think she’d bought it at a yard sale, along with some others, a long time ago. She had this one and the others sitting out on her kitchen table, as she was thinking of getting rid of them, now. She gave me the candle, and told me this spooky story about it. … She was sitting at her table, early one morning, while the house was quiet. She was sipping her coffee, when all of a sudden, the glass lid on the ‘Spirit’ candle popped off with a loud noise, and flew off across the room. It landed quite a distance away, but didn’t break. She was lucky it did not hit her, as it went flying by. There was no rational reason for the lid to come off the glass jar. The table was not jiggled, the room was an even temperature, and the lid had been securely fastened down on top of the jar. She had never burned the candle, either. So, that’s why she was scared of it…maybe it was possessed, or would do it again at any given moment. Anyway, now I have it. I’ve been waiting for it to do something else…hoping it would flip it’s lid again…anything. I thought that being over here, at my house, with the resident spirits and ghosts, would trigger an incident, but so far it hasn’t. I wish it would. Could it be that the ‘spirits’ in the Christmas candle are happier now, being around others of it’s kind? I don’t know, but if it does do anything else strange, I’ll let you know. Just another little story using the words from the game “Words With Friends”. I try to use all the words played in the game to make up a short, fun piece. The words from the game are in bold … Enjoy! Mr. and Mrs. Spiros had a plan. They wanted to own and open a Greek restaurant in their town. Nothing would deter them. After much hard work and determination, it was finally within reach. They opened their dream restaurant on the third day of the month, and called it “Spiros Gyros“. It had been a small, worn, building when they bought it, but they knew if it was a success, they could expand to a larger storefront. Mrs. Spiros would be doing the cooking, as it was her family’s recipes, from the old country, she’d be using. She was also very good at peeling potatoes. Mr. Spiros would be running the business side of the shop. First, though, they had to hire a couple of employees. After interviewing several hopefuls, they hired Ne-Na and Di, as waitresses. The girls were young, but were told if they did a good job, there wouldn’t be any cussing from the management. The restaurant was located on Ox Rout Lane. They hoped to lure customers from the nearby homes, and woo them with their delicious gyros and pita bread meals. The menu included thin shaved meat, and a berry bowl with heavy cream, for desert. Sometimes, Mr. Spiros would lend a hand in the kitchen, taking jabs and zags at the meat. Mrs. Spiros would tend to the cooking, and wrapping the food in foil. It was a good working relationship. Di would greet customers, as they came in, with a wave, and say “Hi“, and Ne-Na would jot down their orders on her note pad. The patrons never said ‘yuch‘ at how their food tasted. It was all good. The owners were happy to give back to the community. They provided entertainment while the customers ate; a duet would sing arias, with ease. Every night they’d sing the same ones. When their contract was over, they went on to find fame in the big city. They didn’t just fade away. You may have heard of them…Qi-Nor and A-Bod. So, in the end, the Greek restaurant Mr. and Mrs. Spiros envisioned long ago, found fame, too. It became the ‘go to’ place for many years. I sat and watched all kinds of people come and go at the estate sale we held at the old homestead. It was weird. My dad had passed away in August, and me and my sister and our husbands were clearing out over 60 years of home items. We’d already gone through it all, and these items were what were left to sell. We’d lived here throughout my childhood, up until I married and moved out, but still it was home…the gathering place for holidays, and visiting…even moving back in with my own kids a time or two. So, yes, there were lots of memories attached to the things people were buying. The image of what used to be, is now just a memory. Not thinking of our family’s woe. Will they wonder? Will they care? Or will we be severed – cut like strings? Time for them to come undone. Our past memories, along with theirs. New memories to make…another beginning. This incident happened a few years ago. It was on Christmas Eve, if I remember correctly. The unlikely place was the grocery store. I’d gone to the store to get some last minute items. The store was crowded, as they were to close early that night. I was over in produce, and this nondescript woman started a conversation with me. She was shorter than me, and had on a beige coat, a scarf, and glasses. Her hair was light brown, going gray, and it was messy. She also had a slight disability in her speech and demeanor. I can’t remember the exact conversation, but it was about the fruits and vegetables, and also about the crowds, and Christmas…things like that. It was a little hard to understand her, but she was nice, and I talked to her for a bit. Then I went on with my shopping. However, everywhere I went in the store, this woman would be there, too. I didn’t see her come up the aisle, and I don’t think she had a basket, but there she’d be, still wanting to talk. So this went on the whole time I was there. I kept getting this really strong feeling…and I kept thinking about angels…for no reason. Then, I thought, maybe this woman is an angel. I couldn’t shake the feeling, it just kept getting stronger. Well, I kept talking to her, as everywhere I went in the store, she would be there right beside me. Then, I seemed to get an inkling…or revelation…of why this was happening. This was a test…a test to see if I was perceptive, and could recognize what was going on. And of my compassion for those less fortunate with disabilities, and in how I responded and treated this woman. There was definitely some kind of reason for this to be going on…I knew that, then. Well, in the end, I went to check out my groceries, and I said goodbye to her. The regular clerks said they’d never seen her in the store before, either. I never saw her again, but she will remain in my memories of that night. Now, I don’t know for sure if angels appear as regular people, at random times, or for what reasons, but in my mind, this is what it was. I have been drawn to the stars and sky for as long as I can remember. There is a need for me to look up into the darkness, even when I was a little kid, sneaking out of the house to look at the starry sky. I still do this almost every night. I feel like maybe aliens know of me, and have made their presence known to me, throughout the years. This story is one of those times. The memory of the incident has haunted me all this time, because of the not knowing why it happened, or the truth of it. I do know it happened to me, and was not a dream. I was always in and out of the doctor’s office for this or that, as a child. One time was really strange. The Dr. was tired of seeing me always in there, and told me if I ever came back, he’d make sure I never did again. He took me and my mom (who didn’t say a word, just followed – which was completely not normal) down some concrete steps, to the basement of the hospital. He was strange looking. He was a very short man, wearing a long white coat, and large dark glasses, so I couldn’t see his eyes behind them. He said to look at what was down there…that these people didn’t listen to him, and that this is what would happen to me, too. It was terrifying. I was probably ten years old. I saw people strapped down onto these huge roulette-like wheels. Some were upright, some were situated more flat to the floor, and they couldn’t move. They were very scared. Once in awhile an assistant would come and spin the wheels around really fast. At that point, the doctor took my hand and pricked my finger to draw blood, for a blood test. Then he said for us to leave. I vowed to never, ever go back to that doctor again, no matter what, even if I was sick, and I never did, even when I did get sick…I just never told anyone I was not feeling well. So, that is how this one ended, but I have reason to believe there have been many other encounters over the years…just not as scary. Anyone have any thoughts on this? Have you had mysterious encounters? I’ve always had crazy, unexplained thing happen in the houses I’ve lived in, even this house I live in now. These incidents happened in the house I grew up in, my grandmother’s house, and houses I lived in when we moved to other states, and countries, and were pretty common. I’ve related some of those stories in my other posts here. Here’s what I heard… “I’m coming back” or “I’ll be coming back”. As I said, it is hard to make out the exact words, but that is what it sounded like, to me. Over and over, I heard the same phrase. I took a few pictures in the room, just in case I would see something weird, but I didn’t see anything out of the ordinary. Just wanted to say thank you to everyone who stopped by here during this month of October Poetry Writing Month. I appreciate that you took time from your day to comment, like, and even follow! I have been trying to visit all of your blogs, a few at a time. I’ve enjoyed reading everyone’s writing…you all have so much talent! I had fun writing these poems with the Halloween theme. Wasn’t sure I could keep it up, and it was a challenge. I’d like to thank Morgan Dragonwillow for inviting me to join the challenge. You can find her at… http://morgandragonwillow.com .